Only a few hours after I had received an email that so brightened my day (an FYI that my second cookbook would go into 2nd printing), I was interviewed by a Swiss magazine: …and of course we touched on the subject of food bloggers who turned cookbook authors. The first signed book contracts by food bloggers were a small sensation back then, in the early days of food blogging, nowadays publishing houses and agents are screening the food blogosphere quite thoroughly for new talents – and the continuing success of food bloggers’ cookbooks proves them just right. Do the math. Naturally, the number of book-publishing food bloggers has increased tremendously over the last years and some real cookbook gems have entered the market. On the downside: It has become quite a challenge to stay up-to-date on all new releases and anticipated publications. That’s why I decided to compile a list of past as well as future cookbook releases – with your help. Let’s get started! Below lists (no.1 & 2) are by no means complete, consider them work in progress, please add missing food bloggers (who have written a cookbook [edit: in English language] or otherwise food-related book or those who are currently working on one) in the comment section – I will update these lists as new entries are being submitted. Only requirement: The food blogger must have started his/her food blog before working on his/her cookbook(s). Finally, I compiled an extra list (no.3) for cookbook authors/food writers who started a regularly updated food blog later on in their writing career (somebody missing? leave a comment!). Anybody missing? Please add name and details in the comments section! What a great list - all the ones I know are already on there so I'm not going to be much help, but I can assure you I will use this page in future as a reference! Pam Anderson should go on list 3 & Pioneer Woman is working on another cookbook. I have to say, that I feel so much more 'connected' to a book by a blogger that I 'know' and follow. There is a person behind the recipes and its not just another faceless cookbook, and it is so much more enjoyable to me. Maybe that's why they've been so successful? thx for the interesting lists, did know a lot, but not all of them. I have a portuguese food blog (i´m portuguese) since May 2006 called As Minhas Receitas (My Recipes) and i´ve been invited by a portuguese editor (A Esfera dos Livros) to write a cookbook. The book is for sale since February of 2011 and it´s called "Feito em Casa" (Homemade). Writing in portuguese for portuguese speaking people is diferent from having a blog in inglish, that reaches almost everybody. But the reasons for a book are the same: recipes tested and that work every time, a target group that folow the blog and the blogger, and that someting extra that makes our blog unique! One I would like to add is one of my favorite foodblogs http://www.cavolettodibruxelles.com Sigrid who does this blog has already published quit a number of books. And no, at my blog we do not have any plans for a book yet. Hi! I am a blogger and I have a book coming out in Fall 2012 with Chronicle Books: Gluten-Free Baking For the Holidays. Thanks! @all: Thank you for your comments. I'm currently traveling and will update the list next week. This seems to be a very US centred list. You left off Donal Skehan, a popular Irish blogger who has leveraged into having 2 tv series on Irish tv, been on UK tv shows, and has a few books out now. Oh, and he's 23. Wooooow, I didn't know so many foodbloggers have published a cookbook. My Amazon wishlist will grow bigger and bigger, especially looking forward to the book by Cannelle&Vanille. It's fantastic to see the list getting bigger every year. Here in Ireland, Donal Skehan published his second cookbook earlier this year, Kitchen Hero, and is already working on his third, while Lilly Higgins from the Stuff I Make, Bake and Love blog has a baking cookbook, Make, Bake, Love, coming out next month and Shelia Kelly from the Gimmetherecipe blog has a cookbook coming out here in spring 2012. I see another commenter has already told you about Niamh Shields and her recently released Comfort & Spice book following on from her Eat Like a Girl blog. 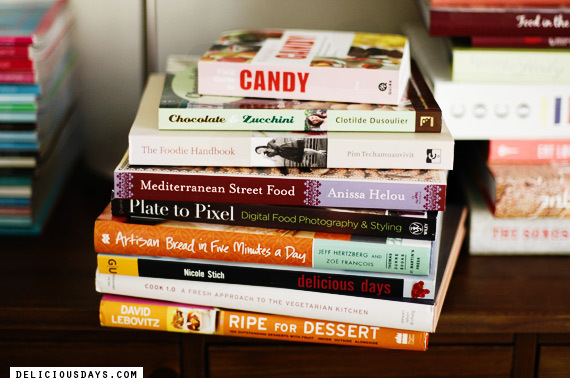 This list is very dangerous for my purse, I'm sure I can't resist to order some more cookbooks. Her book 'Comfort & Spice' was just released. Anne Lataillade (Papilles et pupilles): one book in 2008. In 2006, a book containing stories and recipes from different French bloggers had also been published (Une souris dans le potage). Hello, Any news on having your latest book translated in English? I've forbidden myself to even consider following the links to the blogs I don't know, but I would still like to add to the list of French blogs mentioned by Véronique earlier Linda Louis (Lilo) of the (in my opinion beautiful) blog Cuisine Campagne, who has several books including "L'atelier des bonbons bio", "Tomates anciennes et gourmandes" and "L'appel de la foret"
I wonder when our German blogging bread baking experts will get their first book deal. Would be worth it. The list is great, it gives a very good overview of blogs and books, and certainly a lot of inspiration. One book I'd like to add comes from a London Supper Club (The Underground Restaurant), a food blog that is linked (The English can cook) and this spring the lady behind, Kerstin Rodgers, published her book "Supper Club, Recipes and Notes from the Underground Restaurant". It is at the time a cook book and a guide on how to set up and organize a supper club. I love the book as it has a very personal style, but probably also, because I experienced a supper club with Kerstin this spring in London and became a fan. and Nicole of Gluten Free on a Shoestring published a book of the same name earlier this year. Hi! This is a wonderful list! Thanks for your efforts to put it together. Would love to see MONICA BHIDE on List No. 3. She has written 3 cookbooks and her food blog is "A Life of Spice" . Thanks again! Love this list. So fascinating! Thanks for making the effort to compile this list. Very much appreciated! I agree with your list of conclusions about what makes food bloggers successful. A vital point is also the amateur status of bloggers (I am obviously refering to the ones in list 1). Not too long ago one could mainly refer to a cookbook in order to try to improve ones cooking skills. With the rise of blogs, especially some of the early ones like Julie Powell's and Heidi Swanson's, readers were taken by the hand and enjoyed that they could read about others experiments, adventures and failures. Talking about food is no longer limited to those who have had some form of professional culinary training. What a great list! I would be honored if you would include my book and blog as well... My blog is http://www.healthnutfoodie.com and my book (published in March 2011) is Feeding our Families: Bringing back the made-from-scratch family dinner. I think that this is a great topic to discuss and to chart out! While reading the list I began thinking about how blogs now influence people who are entering into food writing. As an example, could Gwenyth Paltrow make it onto this list? Technically she started her blog GOOP before writing her cookbook. Does her celebrity status influence her categorization? I would like to add Nisrine Merzouki of Dinners and Dreams blog (www.dinnersanddreams.net) to the list. She started her blog just before her book, Marrakesh Express, came out. I haven't yet purchased the book, but I really love her blog. All the recipes I've tried so far (including chicken andana kofte, chickpea bread and more) have worked and tasted wonderful! I started my blog Daily Bites (www.DailyBitesBlog.com) a few years ago. It inspired me to write my first cookbook, The Pure Kitchen, which I just released last week! Thanks for the list and congratulation to your second print. A German additionto list number three is my cookbook EIN TOPF HEIMAT. Rezepte mit Familiensinn und Fernweh. Blog and book are for German speaking expats and everybody else who lives global and eats local. Kelly Jaggers with EvilShenanigans.com blog has her first book out and is working on her second. Nice start on compiling a list. Missed mine. I love these lists. What a great inspiration for those of us just dipping our toes into the world of food blogging. Hi Nicky -- Nice to meet you and your blog and thanks for the great list. I had a couple of cookbooks out before starting my (occasional) blog. Wonderful article and thank you for including Herbivoracious in your list! We also published "Not Your Mother's Casseroles" by Faith Durand, managing editor and blogger for Apartment Therapy's The Kitchn. Please add me to list #3. I wrote Pacific Northwest Palate: Four Seasons of Great Cooking long before launching LunaCafe blog. I'm working on book #2. Thanks for compiling this list! I need all this books. This could be helpful for my future endeavor in cooking. LOVE this post! I feel like there are SO many great bloggers/cookbooks out there. Do you have any favorites? Thank you so much for including me on your list! Food blogger + cookbook authors = yea! Shaina from Food For My Family is currently working on a cookbook! foodformyfamily.com, written by Shaina and Ole, has a book coming out very soon! Technically, my book isn't a cookbook. Although anyone is more than welcome to try their hand at boiling balut or putting sushi all over their lover's naked body!! Thanks for these great lists! I started blogging 5 years ago and have a book out last year, The Reluctant Entertainer. Dinner party featured in new Jo Packhams' Celebrate! book and in USA Today last week. More importantly, love this list of fabulous people, a few who I know. It's so fascinating, the whole blogging world. Thank you! It's fantastic to see so many bloggers coming out with books! I think Shania from Food for my Family is also working on a book right now. Alice (http://savorysweetlife.com/) also has a cookbook coming soon. Kamran (http://www.sophisticatedgourmet.com/) just announced cookbook news. Julie (http://www.dinnerwithjulie.com/) has a cookbooks on beans coming soon. Michelle Stern (http://www.whatscookingwithkids.com/) published The Whole Family Cookbook this year. Mrs. Q (http://www.fedupwithlunch.com/) has a book coming out next month. And I'm sure there are others I've missed. Hope this helps. You missed "dinner, a love story" - think the book was published this year, love the blog. Wow, what an inspiration to all writers. The internet is amazing, but nothing like seeing your words in print. I quickly double check every addition, but if I cannot find any information about an upcoming book, I won't add it. To make sure your (English) book gets on the list, do make sure to provide enough information (e.g. a link to your announcement post). I am so glad I've come across this list! I've actually been cooking through blogger's cookbooks this year on my blog. (I do a cookbook of the month each month.) One that I did see that your list is missing is Our Best Bites. I'm bookmarking this post so I can check some of these out!! Yes, I was writing cookbooks before anybody ever heard of blogs! Great that you compiled these lists--really interesting! I'm not sure it's safe to say that a successful blogger is guaranteed to have great recipes. Some bloggers attract followers due to great pics or great writing, and their readers stay loyal mainly for those reasons. Also, some bloggers are much better than others at creating unique content. Those who started as cookbook authors are much more likely to be in the habit of creating their own recipes--maybe because when people are paying for the content they want new, not adaptations. I'm glad your book is being printed for the second time. You must be really proud. Thank you for offering this list, I love finding new talent myself, even though I have no authority in the publishing business haha. What a fabulous list !! I have no more cooking books to share with you ! What a great idea, to compile a list like this. I'm honored to be included. And I'm grateful for the who's who of sorts, since I was unaware of so many of these blogs and books. The Internet can be so wild and woolly, it helps to have a guide. Wow! That really puts things into perspective! Inspiring as well. I've been working on joining this list for the past two years — traveling China, visiting families in their homes and learning their home style recipes. Presently in recipe testing mode. I've found that more than the goal of a cookbook has sprung from my explorations. So many offshoots and many people met. It has been a heart-warming process. what an exciting list... so much talent in one place! I wrote my book in 2010 for CopyKat.com ;) I am so happy more food bloggers have had book deals! I'm not sure where on your list this should go, but 'a la Carte' has tons of useful info. It's not updated as often as one would like, but who am I to complain? I'm delighted to join your list for 2012! I blog at RusticKitchen.com about farmers and local food, and my book Farmers Markets of the Heartland will be out in May. i started my blog, small measure, in advance of publishing the four books in my "homemade living" book series:http://www.amazon.com/Ashley-English/e/B00348150Y/ref=ntt_athr_dp_pel_1 i also have another book, on pies, coming out in august. although not specifically food-related, my blog addresses small-scale homesteading, which includes, naturally, topics related to the creation of food. Your list is really nice. Keep up the good work. This is very helpful in cooking. Lovely blog. This list is very helpful as it gives a nice information & knowledge. Thanks for sharing it. Wow -- what a list! I love collecting cookbooks and magazines that have recipes and a picture of the recipe in them. I have had so much that I have started getting rid of them. I guess that means I can replace with new cookbooks! First: thank you to Delicious Days for compiling and updating this list! So much inspiration here! Second: My cookbook, mentioned above, has finally been released! We're over the moon and so pleased with how it came out. It's called "Well Fed: Paleo Recipes For People Who Love To Eat" and it's packed with 115+ gluten-free recipes that include no sugar, grains, legumes, soy, dairy, or alcohol. I know! That sounds like no fun, but trust me, I grew up in a family of cooks and taste is our #1 priority. These recipes are super yummy and incredibly healthy. If you want to check it out, visit http://www.theclothesmakethegirl.com/wellfed -- help yourself to a free 30-page PDF sampler of recipes and content from the book. Nicky --> I'm putting together a package for you with the book as a thank you for your blog and for including me on this list. There were times when I thought my book would never get finished, but re-visiting this post reminded me that if all these other awesome authors could do it, I could, too. THANK YOU for this long list, I didn't know there were so many food-bloggers/authors. And wow, so many additions from the comments! Thank You for the list! There are many Food bloggers out there... Nice! many thanks for best list!! Cool to be in the list, the only Z??? always last alphabetically!!! :-) If anyone is interested I have a few posts on the blog on how to write a cookbook, from approaching a publisher to writing, producing and promoting the book. What a great inspiration for those of us just dipping our toes into the world of food blogging. You can add Sippity Sup. He has a cookbook coming Nov 2012 from Ulysses Press. I didn't find Lauren Ulm's FoodBblog VeganYumYum: mouthwatering recipies and great photos. She published a book back in 2010, i guess. This is a great resource. Thanks so much for putting it together and sharing it. I wasn't aware that was so common - that food bloggers turned authors! But look at the success of Julie and Julia! What a great resource! Thanks so very much! I have recently published a free ebook on my blog entitled, "Gluten Free Bread Baking Defined" and am working on my first Gluten Free Cookbook.